A few days ago, I posted my review on the Peach’s Eye & Cheek palette and as promised, this second part will see me blabbering on about the rest of the items I’ve gotten from this collection. 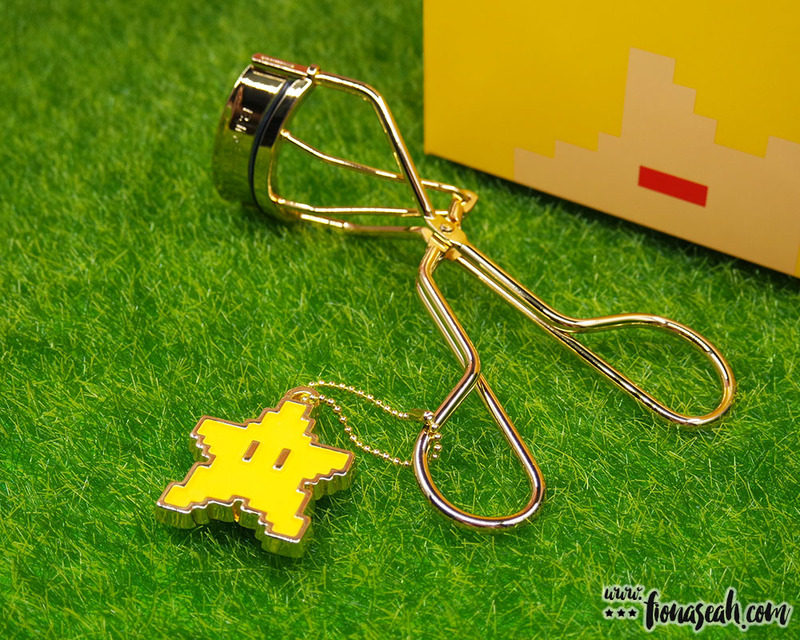 Read on to find out how two shades of the lipsticks, the eyeliner and eyelash curler from the Super Mario Bros. collaboration fare in my book! 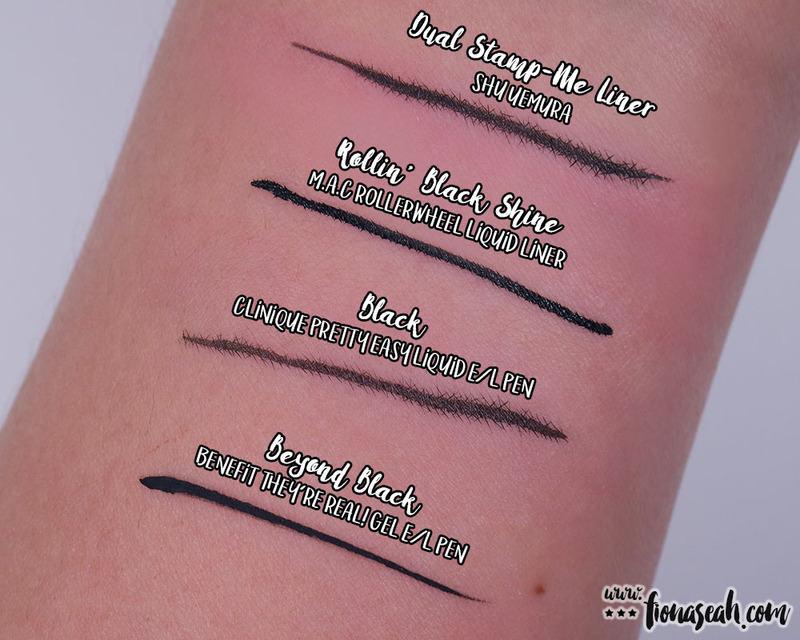 Available only in one shade (a jet black with pinpricks of multicoloured glitter), the dual-ended eyeliner offers a stamp on one side and a felt-tip liquid eyeliner on the other for regular use. For clarity, I’ll talk about the latter first. 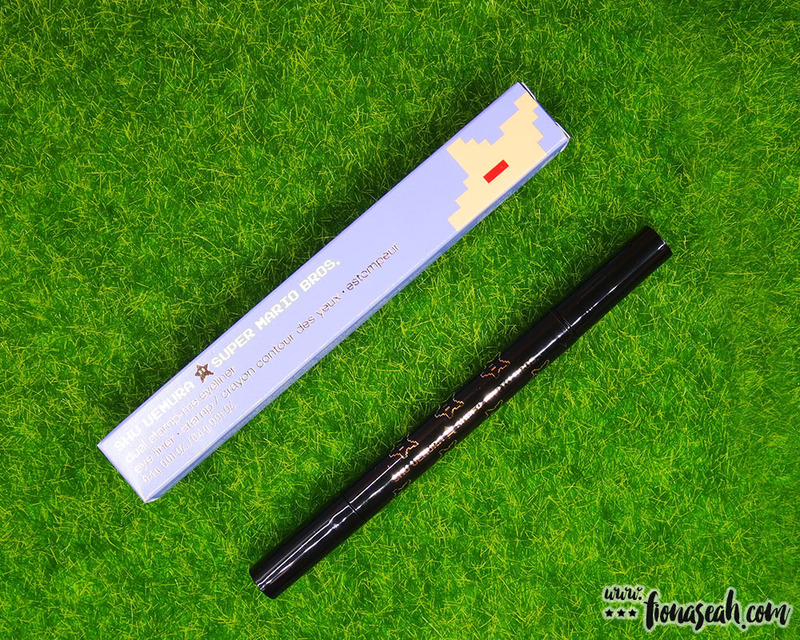 Unlike most eyeliners, this wasn’t love at first application. 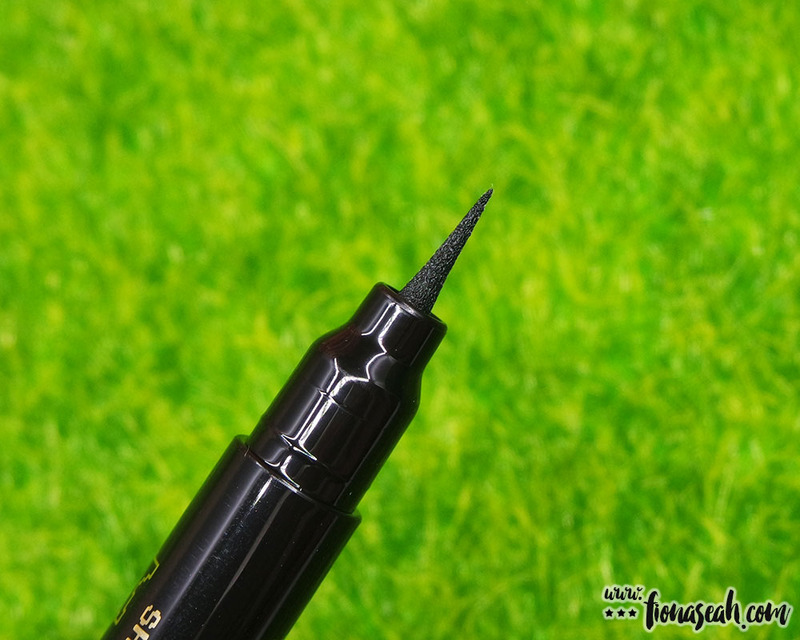 For a start, it skipped and dragged slightly on my lid, and while it is great that the felt-tip has a firm texture for a more controlled application, it felt somewhat scratchy. The ink somehow does not flow consistently and bleeds quite terribly on every first use so I have to test the eyeliner on the back of my hand before applying it to the lids every time. Although those problems would have been curtailed on subsequent uses (within the same application), some pressure still has to be exerted upon the applicator – which I try to avoid because it pricks – for a more pigmented finish. The eyeliner didn’t budge an inch on my upper lid after eight hours of wear but it smudged on my lower lid (partly because I was watching a comedy and I tear up easily when I laugh 😂) and that was even with a layer of eye shadow beneath it to supposedly prevent it from running. I tried to smudge it further with my finger to balance out the unintentional smokey eyes but it stubbornly stays put! 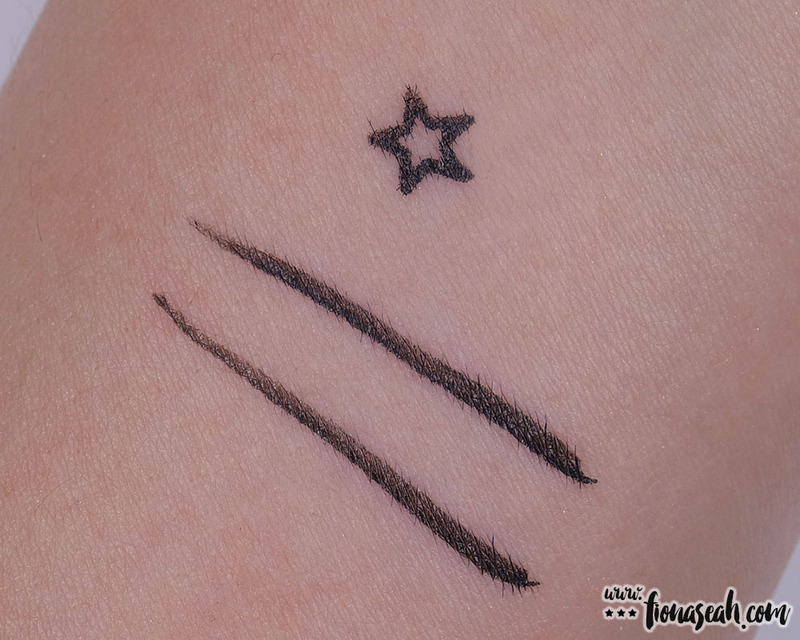 But looking past these flaws, its coverage is remarkably opaque for a liquid eyeliner. Apart from that, it is waterproof, dries down moderately fast with excellent staying power. 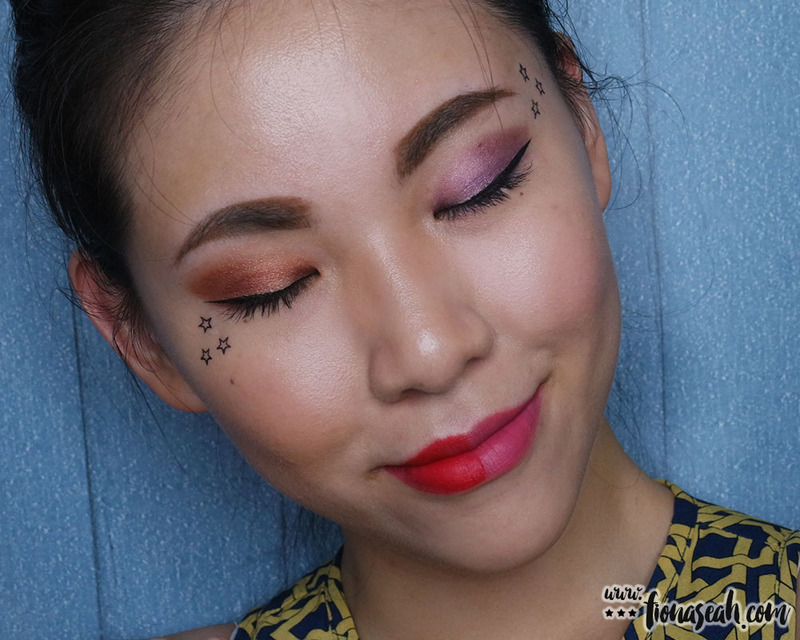 Once you’ve gotten the hang of it, you would be a whiz with creating an intense cat eye and other graphic looks! 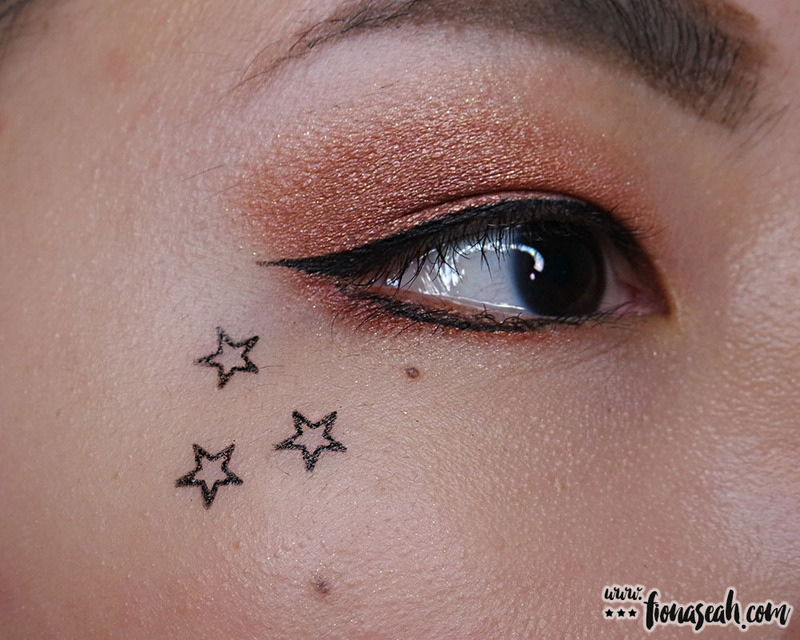 If your attempts to draw perfect stars on your face have always ended in failure, listen up! You can now achieve them in just one simple step with the Super Star stamp! 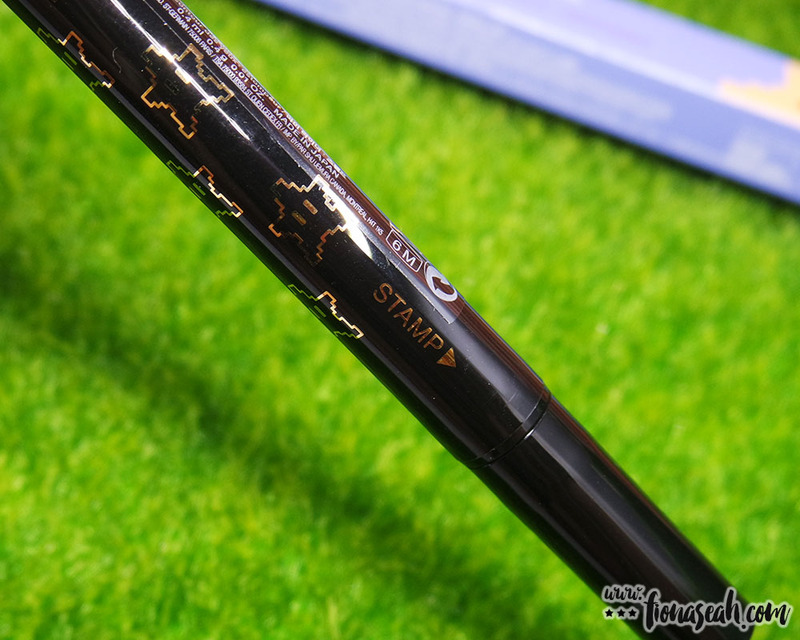 Truth be told, the stamp feature initially felt like a gimmicky tactic to market the eyeliner so I was half-expecting a blotchy mess from it. 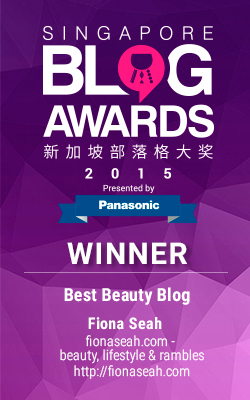 But, boy oh boy, was I blown away by the precision and pigmentation it delivers in a single punch! Not only did it hold up to my longwear tests (by rubbing and showering with it), it had very minimal bleeding on my sandpaper-rough face too which contributed to crispness of the stars’ corners. 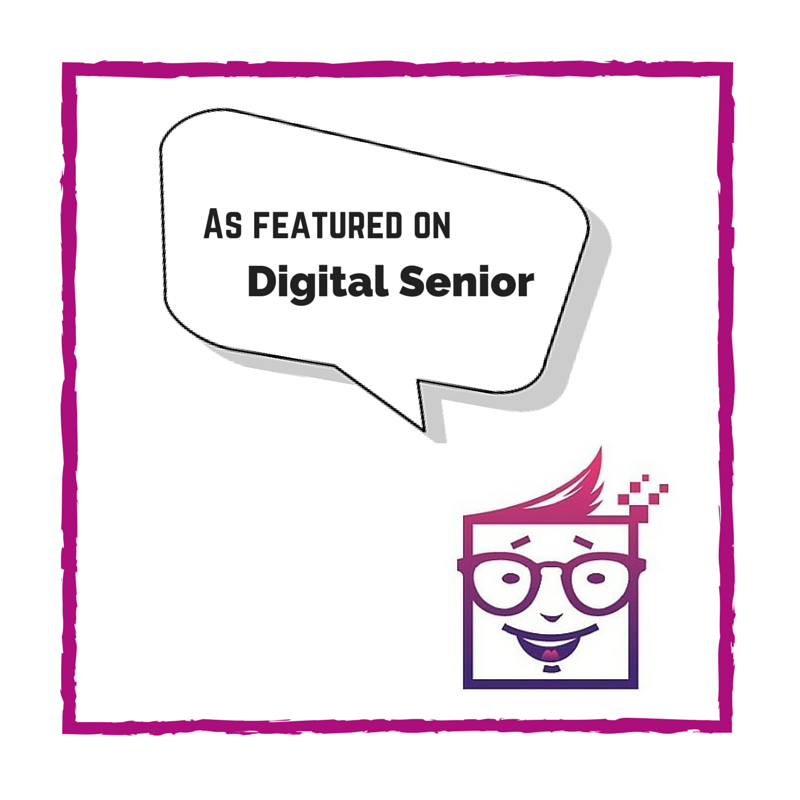 The stamp is fairly easy to use and does not require much pressure to get a clean and even impression (plus pressing the stamp down too hard would also cause the rim to leave an imprint). The ink stays all day without distorting the shape and, on top of that, removes effortlessly with my Sephora cleansing wipe. 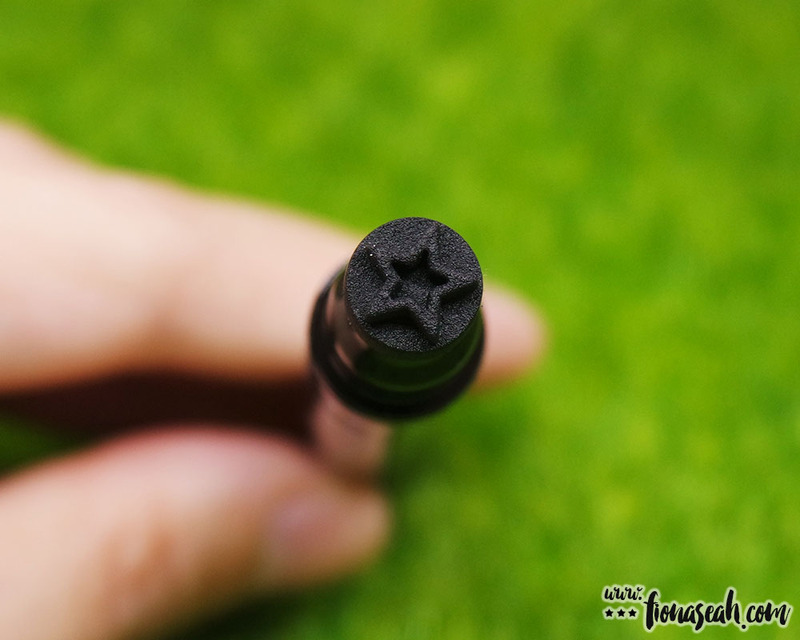 Granted, the idea of makeup stamps may not have been pioneered by shu uemura (see Milk) but I’ve not seen any with a hollow middle like this one which gives users the liberty to fill the stars with whatever colour they want for a more rockstar appeal à la Kat Von D 😝 That said, if only there were more designs and colours to choose from! A sparkle or snowflake imprint would have been so apt for the festive season, don’t you agree? Stamp and eyeliner (two strokes to show continuity of ink flow) swatches. 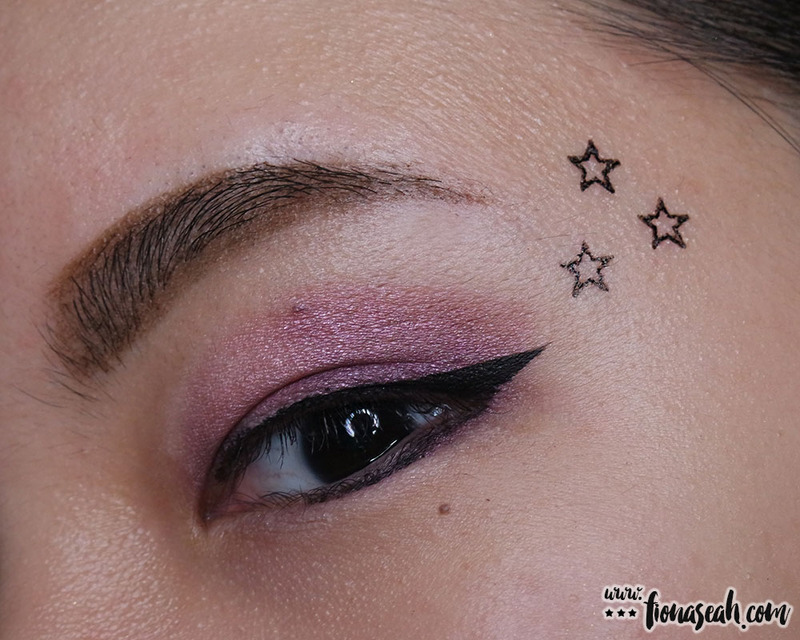 The first pass of the eyeliner is directly below the star. Notice how it bleeds more than the one next to it? The line-up of lipsticks in this collection includes five popular shades from the Rouge Unlimited Supreme Matte series (PK 375, PK 376, RD 187, BG 954 & OR 570) and two limited edition Sheer Shine shades (Stage Cleared & Saved Peach) in translucent dark fuchsia plastic casing housed in light pink box graced by an enlarged pixel art of Princess Peach. The packaging in this collection is to die for but the inner video game nerd in me is totally geeking out over the various 8-bit Super Mario graphics plastered all over the (all-pink 😍) lipsticks in particular. Oh, would ya just look at that? Furthermore, the lipsticks come largely in my favourite finish 😁 In my first shu uemura Rouge Unlimited review, I had declared my desire to try their Supreme Mattes and this collection just about provides the opportunity to do so! To cut a long story short, I loved the finish so much that I actually hit the store to purchase another shade despite having sent me one as a PR sample already. 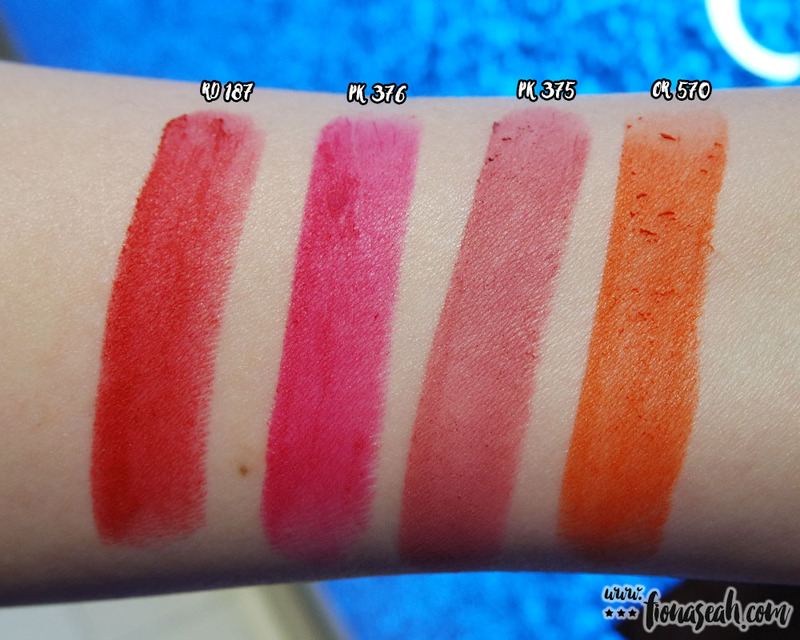 RD 187 is a vivid red with blue undertones and has a “superb matte effect” which shu uemura attributes to their careful selection of matte powders. This lipstick applies with some slip and has the ability to smooth out fine lines without stripping away the moisture so exfoliating prior to application wouldn’t be absolutely necessary. The colour goes on evenly without tug and infuses the lips with fullness and sensuality in spite of the minimal shine. 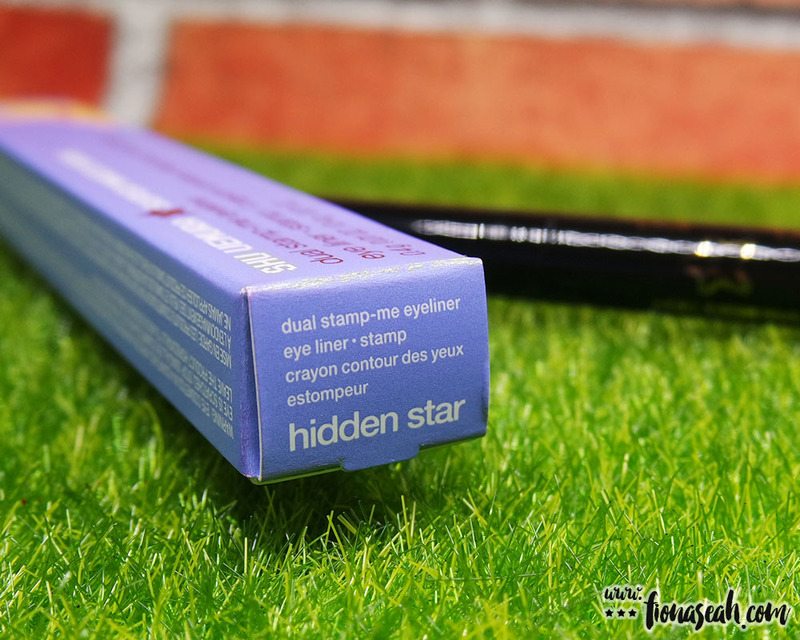 Lightweight with a comfortable texture, it has a medium coverage but is buildable to a full opacity. It stays put throughout the day where unctuous and heavy food and drinks are not involved and fades evenly when they are without the tell-tale ring of colour around the lip line. Also, it is neither drying nor hydrating. PK 375 is a muted plum with pink undertones. Non-glossy, it envelops the lips in a soft matte colour which applies with some tug. This shade gives a medium coverage but is, once again, buildable to a full without weighing down the lips. It has a reasonable wear time (about the same duration as RD 187) and most of it managed to last through the Buttermilk Crispy Chicken Burger I had for dinner the other day, albeit with some of it settling visibly into my lip natural crevices. As compared to RD 187, this actually has a much drier consistency with a slightly powdery texture which could explain its tendency to emphasise any signs of dryness and imperfection. Nevertheless, this self-purchased lipstick still wears rather comfortably (the texture isn’t bothersome) and is overall neither drying nor hydrating. 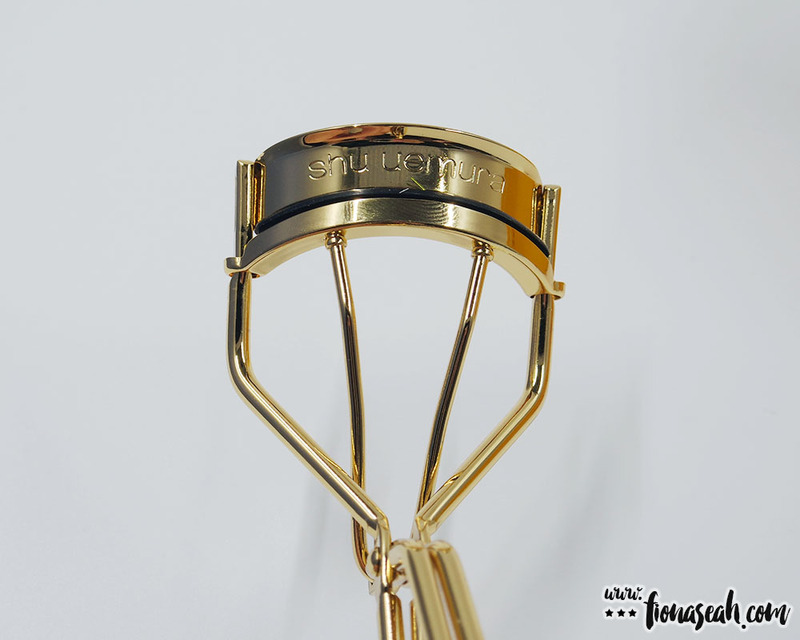 Touted as the Holy Grail of eyelash curlers, the critically acclaimed shu uemura eyelash curler takes on a special appearance for this collection as it gets an all-gold treatment with a polished Super Star charm on a detachable gold beaded chain. For the uninformed, the “uniquely curved” eyepiece is designed to be universally fitting on most eye shapes while the shape of the silicone pad gives an elongated sweeping curl. In addition, the durable hinge at the center of the curler “regulates the amount of pressure applied to the lashes which ensures safety”. 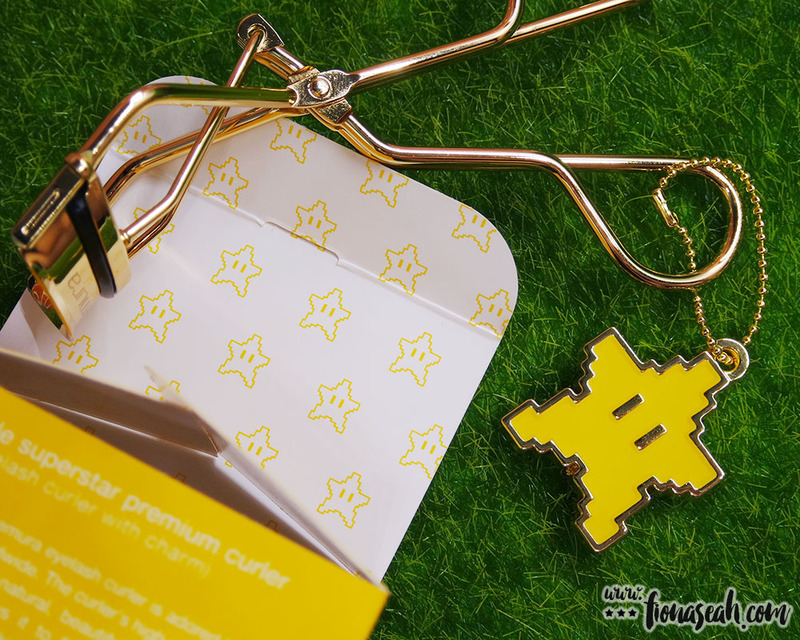 Unlike the eyelash curler in shu uemura’s regular line, this does not include a replacement pad (and neither does the brand sell them separately) so despite being priced the same, the limited edition is essentially marginally more expensive without it. But hey, what’s a few dollars more for a rare packaging like this? 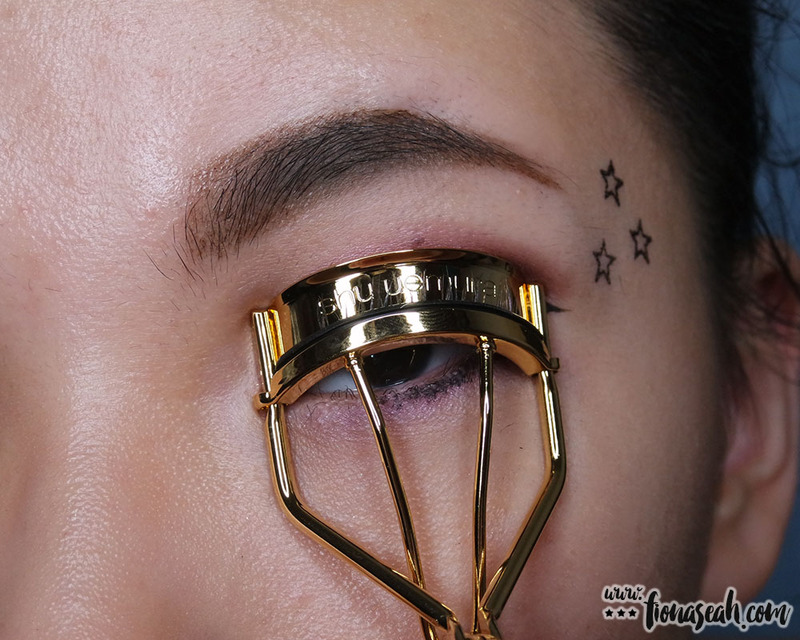 Having already owned a shu uemura eyelash curler from the Karl Lagerfeld collaboration years ago, I have a set of expectations in mind and this works just as well as the one before – or even better. 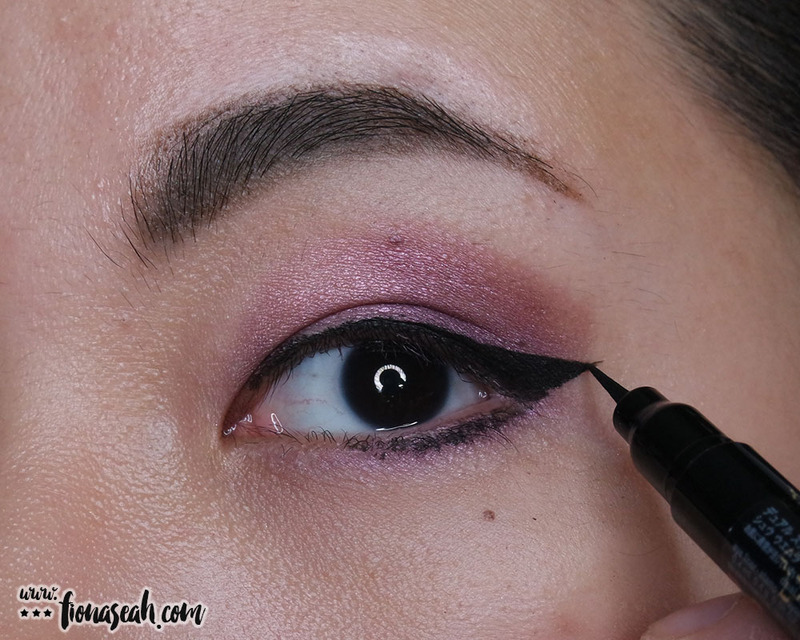 It grabs every strand of my lashes (including the hard-to-reach ones on the inner and outer corners of my eye) without pinching despite having problematic hooded eyes. 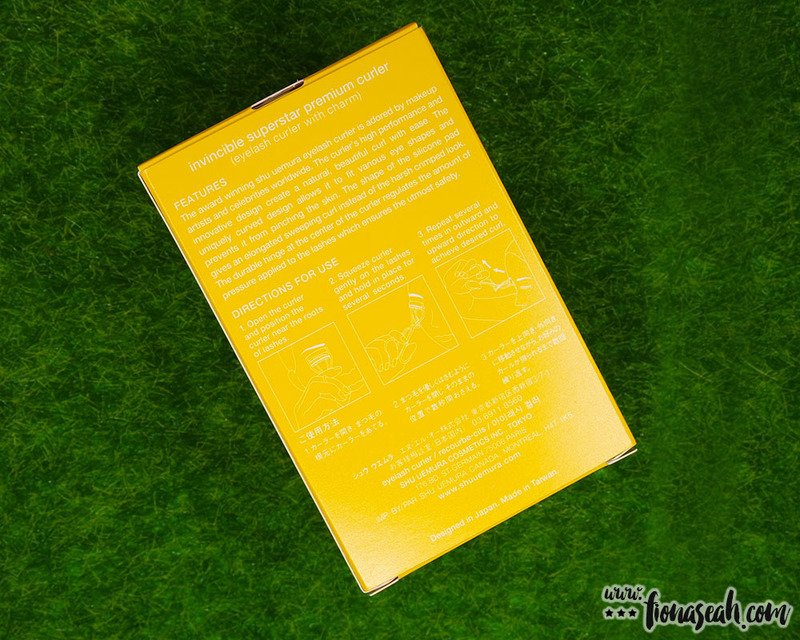 Suitable for beginners, it doesn’t require much effort to give the lashes a natural curl which held up for more than an hour bare (but could be shorter with mascara on). 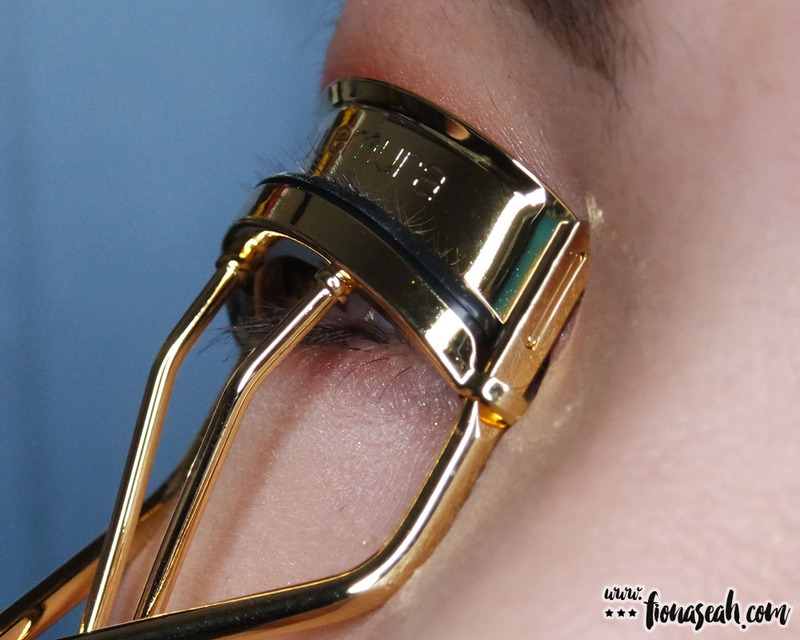 For this, I could actually feel the impact of the curler on my lashes even without squeezing it much. The sharp edges of it left a small impression on both corners of my lid but they fortunately went away after some time. However, I still find the eyelash curler slightly too big for my eye although that’s certainly not enough a reason to stop me from using this amazing tool. Generally, the products in this collection – especially the lipsticks – perform up to par even though prices are steeper than usual. 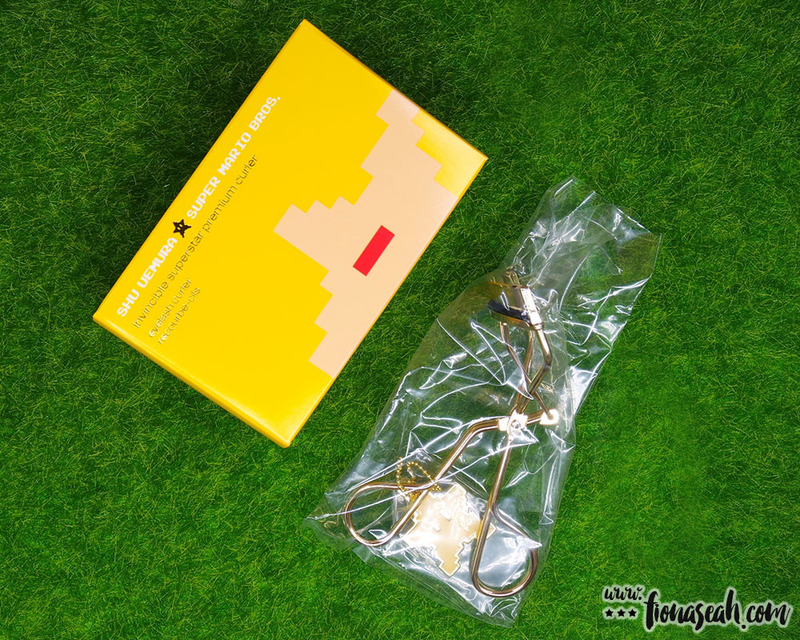 It’s a worthy expense if you like Super Mario Bros or cute, limited-edition packaging. Just don’t get the eye and cheek palette. Without a doubt, shu uemura stole the show with this totally rad throwback collection and judging from the overwhelming response it gets everywhere (most of it are sold out in the U.S. as well as at Tangs and Sephora online), I guess the public agrees too! 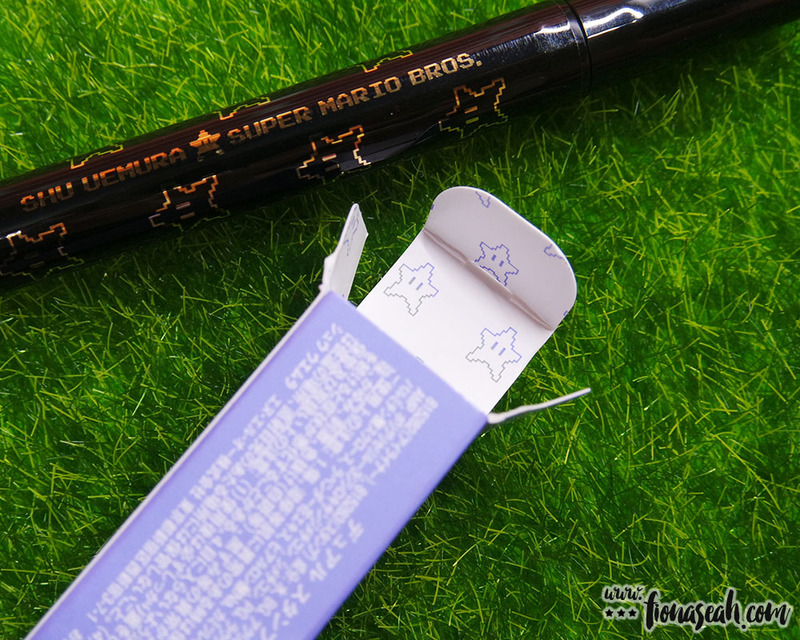 Wearing every shu uemura × Super Mario Bros product I have! Which side do you prefer? 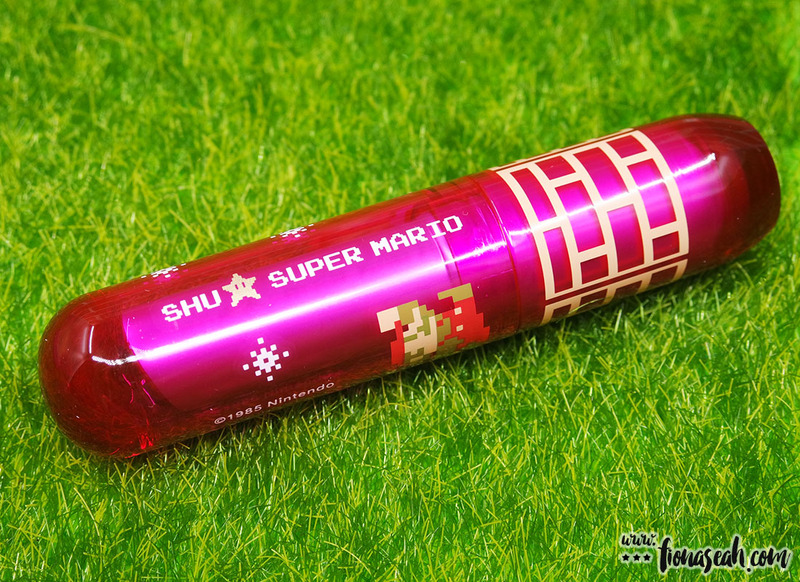 What are you favourite products from the shu uemura × Super Mario Bros. collection? Did you get anything? Let me know your thoughts in the comments below or simply take a poll! shu uemura × Super Mario Bros is now available on the Sephora Singapore (online), at TANGS and shu uemura boutiques islandwide.